Hang it up without screwing it up. Putting stuff on the walls has always been nerve-wracking. Adhesive strips don’t hold up, and nails get real complicated real fast. So we were pretty excited when The Hillman Group came to us with a revolutionary new product that lets you hang just about anything without breaking out the toolbox. 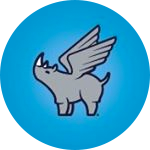 We came up with the High & Mighty name and its tagline: “Designed to Be Stuck Up.” Then we developed a visual identity, packaging and mascot (a flying rhino to represent strength at great heights), plus TV spots and social content to get out the good news that hanging woes are a thing of the past.